Quiz! What Summer Sport Should You Play? 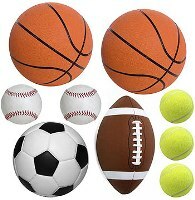 How do you feel about ball sports? I don’t like ball sports at all. I like ball sports where I can hit the ball, like baseball or golf. They’re okay, as long as I can use a racket, like in tennis. I like ball sports where I can kick the ball, like soccer or football.